Spice up your Turkey Day recipes with a few favorites from our Harvest Weekend! Below are a few recipes to recreate at home. Directions- preheat oven 450′, mix vinegar, garlic and spices, whisk in olive oil. In large bowl pour 1/2 of the dressing, add chopped squash and mix so the squash is coated, add squash flat on baking sheet, salt and bake 15min (depending on size of squash check to see if done with a fork). While squash is cooking, using same bowl that squash was in, add chopped kale, pistachios and figs. Add dressing slowly to not over dress and massage kale with fingers so it begins to break down. Add warm squash over kale mixture and let sit 5 min so kale wilts. Toss right before serving. Directions- melt butter, in food processor chop hazelnuts and chocolate, in 9×13 pan line 1 sheet of filo dough and brush with butter, continue this until you have 8 layers. Add 1/3 of nut and chocolate mixture, layer filo and butter for 4 more layers, add another 1/3 of hazelnut chocolate mixture, another 4 layers of butter and filo, remaining hazelnuts chocolate mixture and finish with 8 layers of filo and butter. Let sit 25min room temperature. Preheat oven 350′ In saucepan add water, honey, nibs and cinnamon sticks. Bring to boil and then remove heat and let sit for 30min. Strain into bowl so you have a dark chocolate cinnamon syrup. Slice baklava in squares and then diagonally to make a triangle (makes 24) Place in oven 25 minutes on 350 uncovered, then turn heat to 300′ and bake 50 minutes. Remove from oven and ladle syrup on top, let sit 2hrs before serving. Enjoy with our Cabernet Sauvignon! 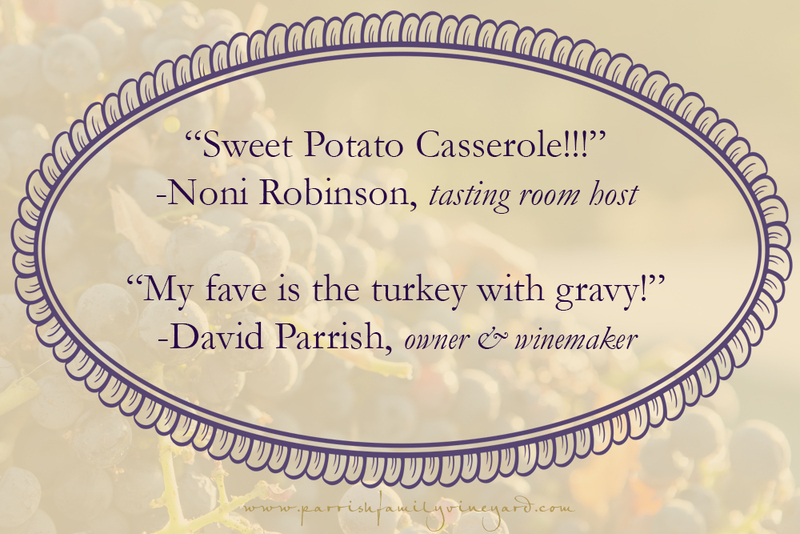 Noni and David now share their favorite Thanksgiving dishes! Noni’s says that this easy sweet potato casserole is like desert with the buttery and sweet topping. It truly sounds delicious! And David goes for the classic with turkey and gravy. He does seem eager to carve the turkey every Thanksgiving! Although, as the carver he hands out little samples to everyone in the family. May your Thanksgiving be full of love, joy, and gratitude! Bree shares a delicious roasted butternut squash dish that sounds perfect for Thanksgiving, or anytime during the fall/winter months. I’m thinking you could even substitute the butternut squash with pumpkin! 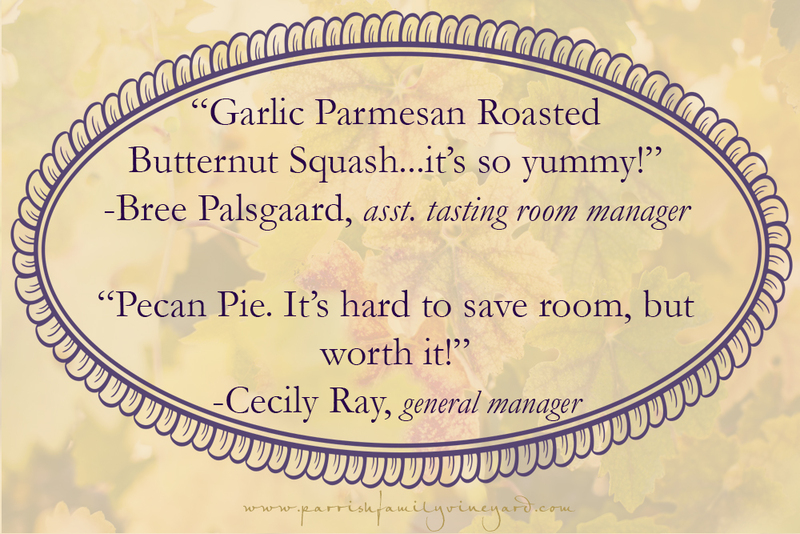 My favorite dish is Pecan Pie because it’s not only a delicious way to finish the meal, but it brings back memories of being with my grannie who also loved pecan pie. Lynn chose a very classic gelatin dish that has been one of our holiday standards. Nana was a very joyful person who loved singing, being with family, and cooking for Thanksgiving. 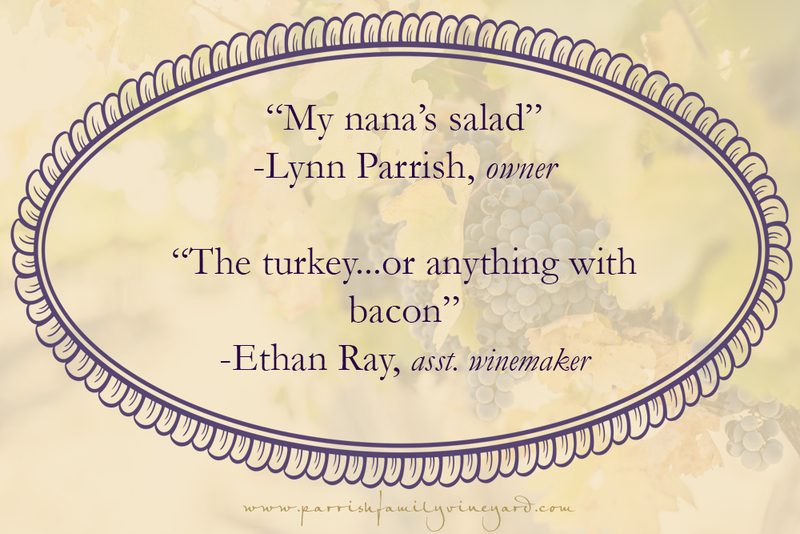 Ethan, being the Turkey Master of the family, picks two delicious proteins of the holiday…turkey and bacon!